Overall Score: 5.5/10 (5 is average): Only one game mode and 7 arenas to battle in. Some annoying gameplay features quickly wear out it's appeal. Released on November 2 of 2018 by Flying Tiger Entertainment, Heavy Burger is a twin-stick shooter where up to four local players battle each other across seven different arenas to deposit their money in a bank. 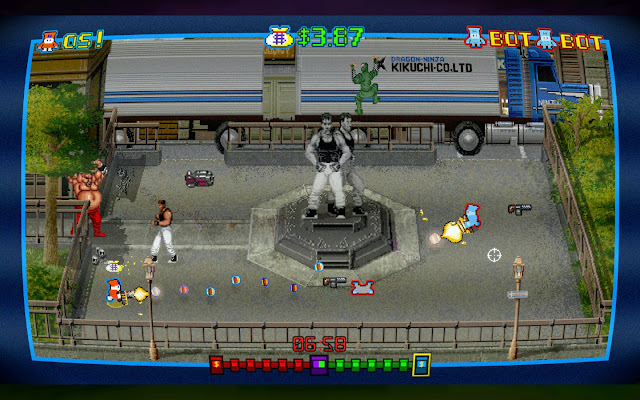 Utilizing much of the art from Data East games, the idea of mixing Bad Dudes and Lock N' Chase is a recipe for awesome. Does the potential hold up against the hype? Click 'Read More' below to get my complete perspective about the game. Each match is composed of two teams trying to carry a bag of money to their goal zone. The teams can be either one versus three or two against two. CPU teammates can be assigned if needed and the A.I. is pretty good for the majority of the arenas. In between the starting arena and the goal zone are up to five arenas to fight through depending on how long you want the game to be. These arenas can be randomized or manually selected before play begins. The arenas are based off of five different Data East games. They are: BurgerTime, Heavy Barrel, Lock N' Chase, Karate Champions, and Side Pocket. You can select how frequently obstacles are spawned into arenas. Finally, you can select the time limit on how long a match can go on before Sudden Death mode is applied. Sudden Death mode lengthens the respawn time by about four times as long as normal and will instantly take one team to the next arena they haven't gone to instead of the arena they are currently next to. A neat thing is you can have Sudden Death mode on from the start, making the matches very quick. After that, the game begins. Every game starts in the Heavy Burger arena, a prison-like stage with a bridge in the middle closing and opening after enough time has passed in game. A money bag is dropped in the center and whoever grabs the bag must go either to the right or left exit depending on their team color. Whoever escapes goes to the next arena and begins that arena with the money bag already on one of the teammates who escaped with the bag in the previous arena. 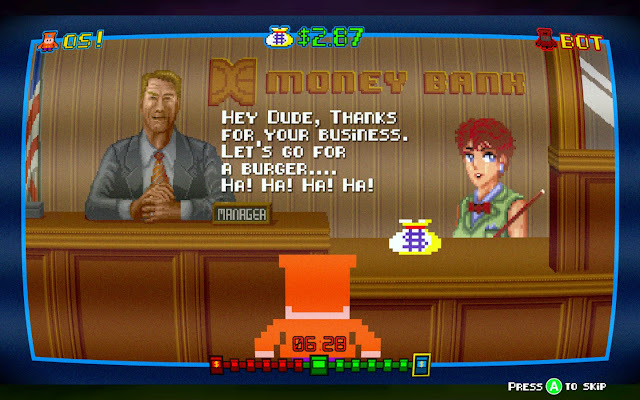 This is repeated until one team delivers the money bag to a bank in the final arena modeled after Bad Dudes. There are six guns to choose from in Heavy Burger. They are the Default Gun, Machine Gun, Sniper Rifle, Shotgun, Super Shotgun, and Laser Gun. Each gun has a different range their projectiles can reach before disappearing as well as fire rates and spread pattern. You always start with the Default Gun and are required to pick up the others if you want to use them. One minor nitpick is you cannot save the gun you currently have if there is a gun in your path. You can technically do a jumping dodge to avoid picking it up, but tumbling can leave you open for attacks, making it annoying to deal with. Each gun has a knockback effect. The severity of the knockback is dependent on the gun equipped. The knockback can be used to quickly jump out of the way of a threat instead of using the dodge action. However, basic running or using the dodge action tended to work better than using the knockback of a gun as a defensive maneuver. Every projectile other than the Laser Gun is propelled at a somewhat slow speed, making the majority of the combat about leading players into bullet patterns they can't dodge in time. 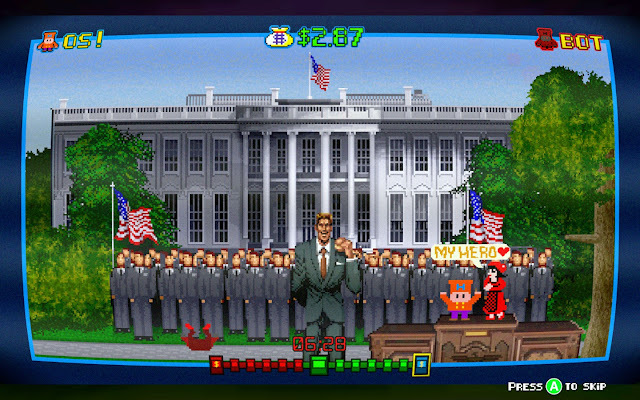 Every stage can have an assortment of neutral opponents depending on the options selected at the start of the game. By destroying any of them, there is a chance a speed boost power up is dropped, allowing for potential strategies that utilize the increased speed. The speed boosts can also drop from players dying. Not much to say in regards to graphics. Almost everything in the game is reused from the six games selected for this concoction. The art is bright, colorful, and pleasing to my eye as a fan of retro games. No sloppy pixel art to be found. This is pretty much a dream come to life for my favorite Data East games. For sound, the classic voice samples are used and are awesome. Sounds effects are clear and do a great job at providing the impact of a gun firing and burger bullets colliding against targets. The sound is perfect for what it wanted to accomplish and I love it. My only complaint about the sound is they use two songs throughout the game. One of the songs is a remix of one of the games (I forgot which one, sorry) and is used the entire time until Sudden Death mode activates and a different song is played that is faster paced and more intense to reflect the panicked nature Sudden Death is suppose to bring. The songs themselves are decent, but aren't groovy enough to listen repeatably. I muted the music after a few games due to those problems. It is a burger themed version of Capture The Flag. The game mode can get stale in any game and this one relies on it being the only mode. Once I played the game through for the third time, I didn't want to play anymore. I kept going so I can analyze more of the level design and gameplay for this review. Out of the seven arenas, I liked two of them. Side Pocket was my favorite due to being able to fling billiards at other players. Karate Champion, Heavy Burger, and Bad Dudes are mostly empty arenas with little strategy needed. Heavy Barrel was a little too chaotic because of how cramp the pathways were to each exit, making success more of a luck factor than skill. 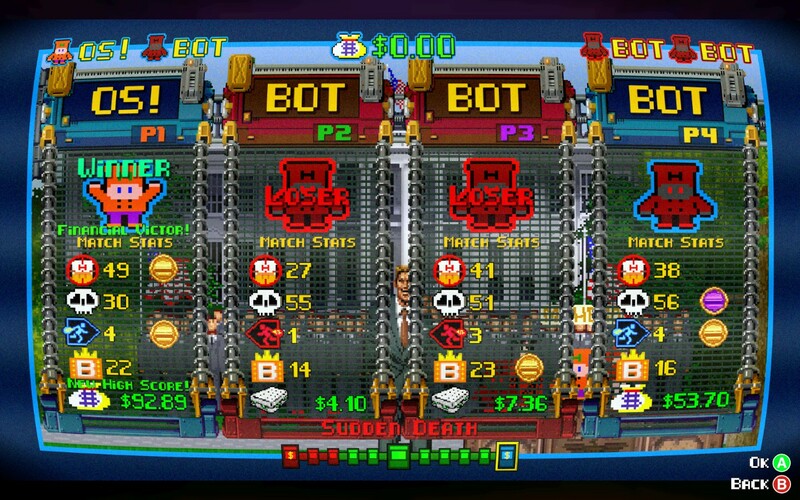 Lock N' Chase is a Pac-Man clone, so you get a Pac-Man stage where you need to use planning to effectively compete in. With no variance in each arena, it reinforces the monotony one game mode can bring. For me, I hated the knockback effect when firing every gun. If it was just the Super Shotgun and Laser Gun, I would be fine with it since it would make thematic sense to have such powerful weapons have recoil like that. For the other guns, it adds artificial difficulty so it isn't as easy to shoot the weapon accurately. Just the projectile speed alone makes it difficult to hit a target, so why add more barriers? My last complaint is the control scheme. The game was built for consoles and more specifically for the right analog stick to be a full motion aiming device. What that means is you have a complete 360 degree control based directly on where you move the analog stick. The problem with implementing that to PC is the mouse is used to mimic that pin point motion, but the default controls for PC make the aiming too loose to use. A slight move up and I'm almost aiming behind my character. However, this is a minor complaint because that option can be disabled and becomes much easier to play. I still don't like this retro inspired game having that kind of free motion for aiming and would rather use the classic eight-directional-aiming system to give an accurate representation of twin-stick shooters during the time of these Data East games. Simply put, this game needs more content to be one I would recommend to others. The presentation is very good and was the initial reason I wanted to play this. The gameplay and variety is shallow though and would work as a decent arcade game, but it is not good enough to pay the current asking price of $8 for PC or $20 for Nintendo Switch. If this game was released for the arcade, I would have spent four quarters and never looked back.